Customizing/playing with colors until I’m satisfied (I can never paint a wall straight from the can) and do-it-yourself anything are two of my favorite ways to spend time. So when I also came across tutorials on Pinterest about making your own inks with Sharpies and alcohol, I couldn’t wait to try it. I know 1/2 ounce goes a long way with the inks, but being able to make more for less $$ is always appealing. These videos by Karen Lotz told me what I needed to know about this easy process. This is where the how-to part is detailed. 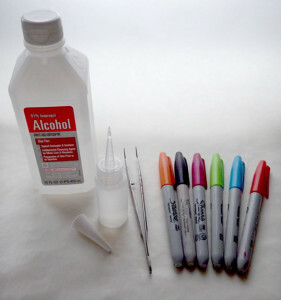 Part 1 focuses on the colors in her marker set, dropper bottles and storage caddy she uses. 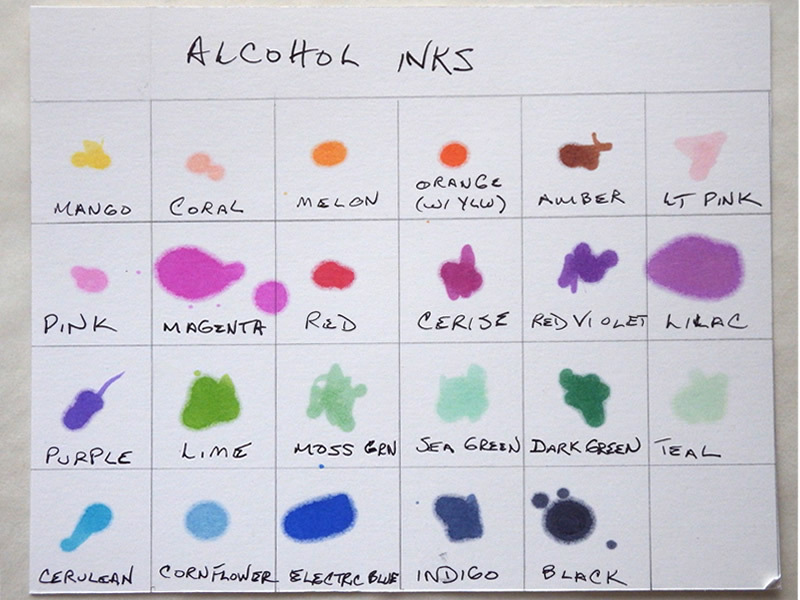 For the total cost, I would have been able to buy about 9 bottles (.5 oz each or or a total of 4.5 ounces of ink). 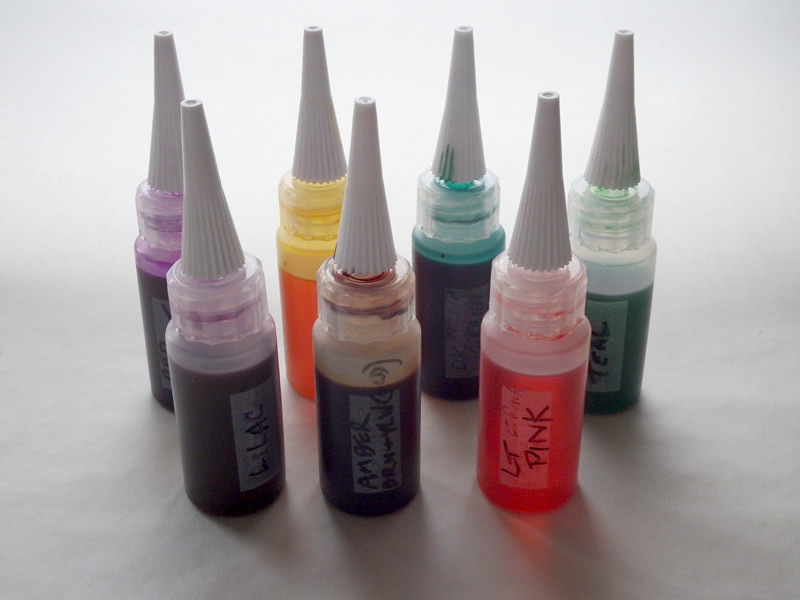 These supplies made 23 colors in 1 oz bottles (I decided not to make gray) – 23 ounces. That’s just over 5 times as much for the money! The videos call for 2 ounces alcohol, so what I made is twice as strong. This worked out well, since even at double-strength, some of the colors seemed a little weak. Fine with me… I’m going for the muted colors of sea glass. If I’d used the amounts called for in the videos, I’d have 10 times as much ink rather than only 5 times as much. Tweezers – with a long, bent tip. The unusual tip isn’t essential, but it was helpful. Small jars (baby food size) – you must know somebody with a baby. I soaked the filters in clean, used 4 oz. containers that I had from making creams and lotions and was so glad to give them another life. If you make bread, yeast jars are about the same size. Clean, empty cat food or tuna cans could work, if you had something to cover them with while they soak. You probably don’t want to be wallowing in alcohol fumes for hours. Bottles – the tips of bottles I got from Amazon were a bit inconsistent. 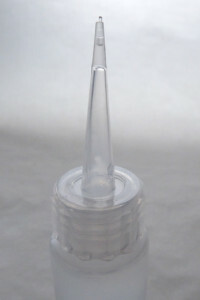 They’re like caulking cartridges, where you cut more or less off the tip to determine the size of the opening. The top of the air space was in different places and it was difficult to try to work around that by cutting just short of that space and then puncture them with a needle (so drops would all be the same size). It isn’t a rant about meticulous manufacturing, but if you cut slightly too low, which is tough to judge, it can get messy. Some of the caps were also be leaky. I put some masking tape around the threads inside the cap to make it a bit more snug, like using plumber’s tape with pipes. Tweezers – I happen to have a pair of tweezers with a long bent tip. They may have come from a batch of old dental tools I recycled for printmaking years ago. They made this job so much cleaner. I used them to separate the inner filter from the colored plastic piece that holds the nib and to hold the filter steady while I cut it in half to fit in the jar of alcohol. Needle-nose pliers – between the tweezers and these, my hands barely came in contact with the Sharpies. I pulled the nib (very easy) and the colored piece of plastic the nib sits in (not so easy) out with them. That plastic piece can stick and need some coaxing. A firm grip with the pliers, the gray tube in your other hand and maybe some twisting/tugging should do the job. Markers – the ones I used, even though they were from the same set as in the videos, didn’t have color names written on the body or packaging. 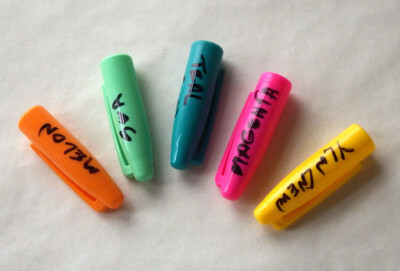 I kept the caps and wrote a name that I made up (in Sharpie, of course) on each one, heavily influenced by childhood crayon names. I matched this to the color chart I made for the inks, so that if I ran out of a color that I loved, I could take the cap to a store and hopefully find it again. I made this for reference, since looking at the bottle doesn’t give you a whole lot of help – all the purples look the same, for example. The plan is to make test pieces from polymer clay, so I can judge how the color in the ink bottle or what I see on the chart changes as it’s mixed with the clay then baked.